"The 3-cell ThinkPad Battery 61 is a replacement/spare battery for ThinkPad new T-series system. 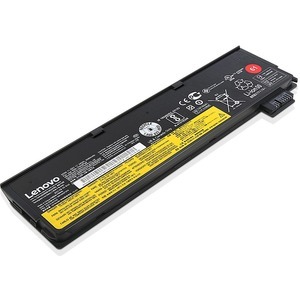 The battery is rechargeable and can be used as replacement or as a convenient spare for ThinkPad T470 & T570 systems. This battery is powered by Lithium-Ion technology and has a safeguard chip which authenticates with Lenovo systems. The battery lasts on average 24 watt hours and utilises over-discharge protection to ensure a secure flow of power. Many factors affect battery life. These include: screen brightness, battery conditioning, features, applications, power management and other customer preferences."